I grew up in East Germany where peanut butter, like other stuff as bananas, oranges, kiwis or other exotic fruit and vegetables, were not available. In fact, I had no idea that there was something like peanut butter out there. When I came across it the first time, I must have been in my late teens or early twenties, I found the smell alone quite gross. I could not imagine that people could be crazy after peanut butter jam sandwiches. Perhaps it was the combination with sweet jam that just did not fit into my ideas of food combination. 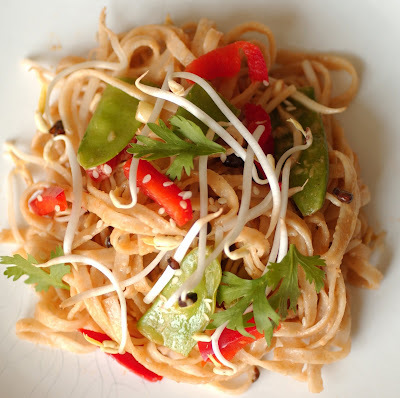 Recently I came across a few noodle salads that used peanut butter in their dressings. They sounded yummy somehow and since I had a glass of peanut butter in the pantry, I though I give it a try. I mixed bits and pieces of several recipes together and I must say I really liked the result. Cook the noodles according to the instructions. Combine all ingredients for the dressing in a bowl and stir until it becomes a smooth paste. Add the dressing to the cooked noodles and stir carefully until they are thoroughly coated with the peanut paste. Cut the pepper and spring onion into fine slices, and the mangetouts into halves. Add them to the noodles and sprinkle sesame seeds and coriander leaves on top to garnish.